The media is the powerful entity on earth. They have the power and control the minds of the masses. 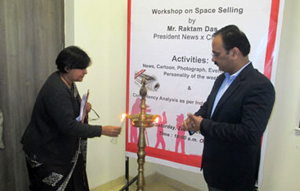 ABS Media Club Activity started with the Lightning of the Lamp by Dignitaries. Presentation was made by Mr. Deepak Arora of PGDM IV on ‘ANALYSIS OF COMPENTNECIES & SKILLS REQUIRED BY INDUSTRY”. Students of PGDM-II research and gave presentations on the topics : ‘NEWS OF THE WEEK”, ‘PHOTOGRAPH OF THE WEEK”, “EVENT OF THE WEEK”, “PERSONALIT Y OF THE WEEK”, and N’NEWS OF THE WEEK”. They also shared the reason for selecting these topics and their impact & contribution in Media Industry. Ist Winner team was Mr. Fondy and Anirban (Article of the week), 2nd winner Team was Ms. Suchi Das and Ms. Shivi Tripathi (News of the Week) and 3rd Winner Team was Mr. Ajay and Mr. Manish (Personality of the Week). All winners were from PGDM-II. Notice Board Display on Media Industry was won by PGDM-II B Team. Congratulations to the Winners. Esteemed Guest from Industry Mr. Raktim Das , President News X Channel with 18 years of rich experience in the media space spanning newspaper, magazine and television. Mr Raktim Das shared his experience with ABS Students and suggested them to get aligned with Paradigm shift in Media Industry. He suggested students to focus on consumer behavior because consumer dynamics is changing. So plan your media strategies keeping these in mind. In media industry decide your marketing strategy for 4 years and not for 10 years ahead. Set of audience is changing rapidly, team changes completely and consumers are also changing like from toddler to 80 years. As a management media professional there is a need for passion and drive – enjoy your job. The latest call for the media industry is BIG DATA ANALYSIS which helps media management professional to understand behavior on digital platform.